UI Form Serialization format had been changed to the human readable xml. I have been trying multiple variations on your recommended coding suggestion with no success. I believe I have found the reasons why, which has to do with the way your internal object structures for the menu reflect their information. If you notice the RenderBounds between the when the grid structure is created and when it is finally displayed, you will note that the dimensions change from "0,0,0,0" to that of "0,0,1200,1000". This appears to mean that the display grid will cover a much larger area of the screen than the actual displayed components take. This also appears to mean that the capturing of mouse-over events can be trapped at the much larger grid-level than should be. I have been able to test this by selecting a point on the displayed screen outside the bounds of the actually displayed menu and yet the function that validates for a mouse-over test for the menu returns "true" when it should be false. In addition, I have not been able to easily drill down further into the menu's internal structure to be able to test the actual, individual menu component structures for similar properties. And yet, even if I can, these similar properties appear to be unaffected by any mouse-over events. If you notice, the "IsMouseOver" boolean property is "false" for the "Horizontal Menu" structure even if one were to place the mouse directly over the main menu strip that is stretched across the entire top part of the screen. If I have done my analysis correctly, these disparities are why your suggested code is not yielding the expected results. This would be fine if such interfaces were to be defined on completely separate screens as is often shown for beginning game tutorials for 2D games. However, I am attempting to develop a rather complex simulation and to date the Myra UI is the top interface library I can find for MonoGame. And I have researched such libraries quite extensively. So the Grid stretches over the whole screen, that is why it always returns IsMouseOver=true and my suggestion fails. I just sent you an email with the notes I posted yesterday and then noticed that you had responded in the forums here. I will give your suggestions a try in a little while. I was just able to implement your newly recommended code for the testing of a mouse over in my menu system. It appears to be working now as needed. I have noticed only what appears to be a minor "bug" but that appears to be in my own hex highlight clearing code and has nothing to do with the menu system. Also issue #40 had been fixed, @SNaidamast. This version contains refactoring and bug fixes based on the feedback I got. Right now, functionality wise Myra is close to what I've planned originally. Though a few essential features will be added eventually(like support of the mobiles and maybe version for Xenko engine). For now I am going to concentrate on better documentation & samples. 1. Support for the .Net Core. Now Myra can be used in conjunction with the MonoGame.Framework.DesktopGL.Core. 2. Revamp of the Myra Project Site. Updated screenshots, added NuGet/AppVeyor badges and restructured the text. 3. Fixes for #47 and #48. 4. Refactoring of the input system events. NuGet had been updated too. I just tried out your latest version of your Myra-UI. 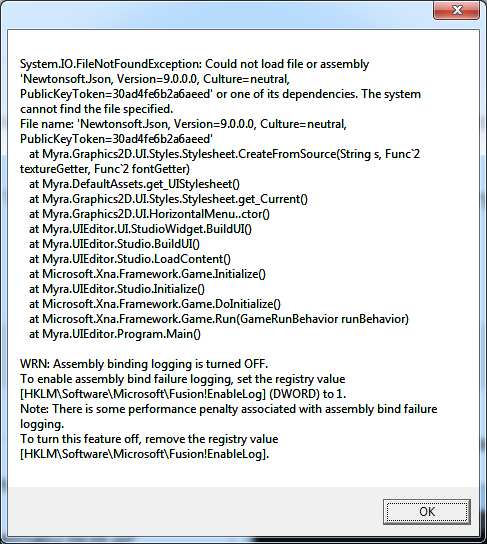 It seems that the Myra Editor keeps on crashing\closing no matter what option I select. I went back to the version I am currently using and tested the editor out and everything worked fine doing the same tasks I attempted with the latest version. If I may suggest; you should consider how you initiate a new project. In the version of Myra I am currently using, you left-double click on the project pane, which creates a base grid for the project and then select "New" from the drop-down menu in order to initialize a new project. At least that is the way I have been doing it. From here you can begin building your interface by adding the individual components. If you do the same exact set of tasks in your recent version of Myra, no base grid is created in the project pane. And if you attempt to add any available component, the application simply closes out. There is major difference beetween new and old Myras - new Myra has many different containers: Grid, Panel, ScrollPane, SplitPane, Window, Dialog. Therefore I removed creation of the Grid as root container as a user may want to have, say, Dialog as root container. Though now I see that adding root container isn't intuitive. So I'll add some kind of New Project Wizard that pop ups after pressing "New" button where one could select the root container type. Also as you can see from that animaged gif, I couldn't reproduce crash as well. Though I found another crash related to the "Reset Stylesheet" menu button. Anyway in the next version UI Editor wouldn't quietly close but show MessageBox with error text. I have figured out the use of your new Myra Editor but every time I try to save the project, the editor simply closes out. So I'd recommend trying out new version. Perhaps depends on the operating system. The editor well works at Win8. On Win7 differently: on one computer it is closed in attempt of preservation or export, on another - it is not started. I did preparation on Win8, then transferred and finished on Win7 manually, by code. It is not difficult to write everything the code.